Time to dig and store your dahlias! 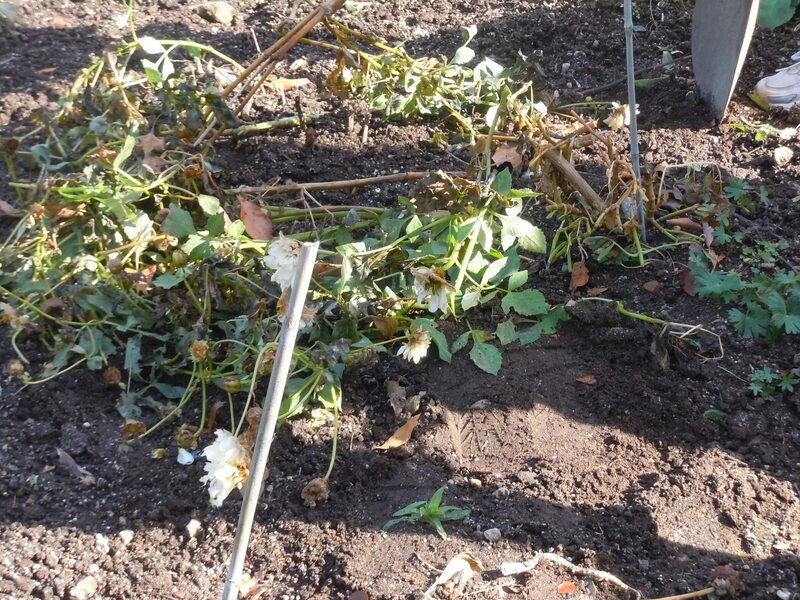 If your dahlias have been hit by a killing frost, it is time to act! 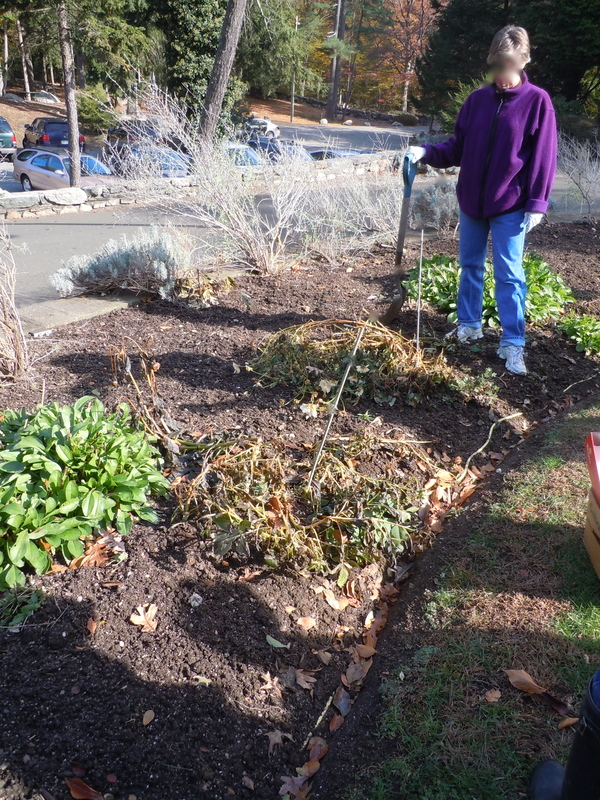 I attended another great workshop at the Garden Education Center of Greenwich given through the Greenwich Dahlia Society. 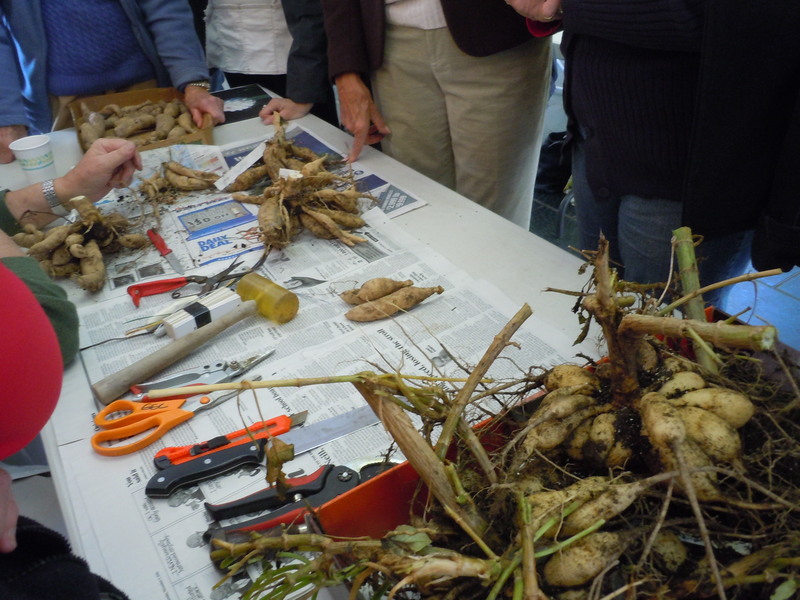 I love a hands on workshop and I found I still have more to learn about digging, storing and dividing dahlias! In brief, once a dahlia has blackened due to frost, cut the stalks down to about 4 inches. Wait a day or so, to allow “buds” to form and then dig gently out. Loosen soil on each side and then gently lift. Shake off soil. During the workshop yesterday we learned so much about dividing. There were many questions and lots of misconceptions. The ladies could not get close enough or ask enough questions of our expert. He had all the answers! 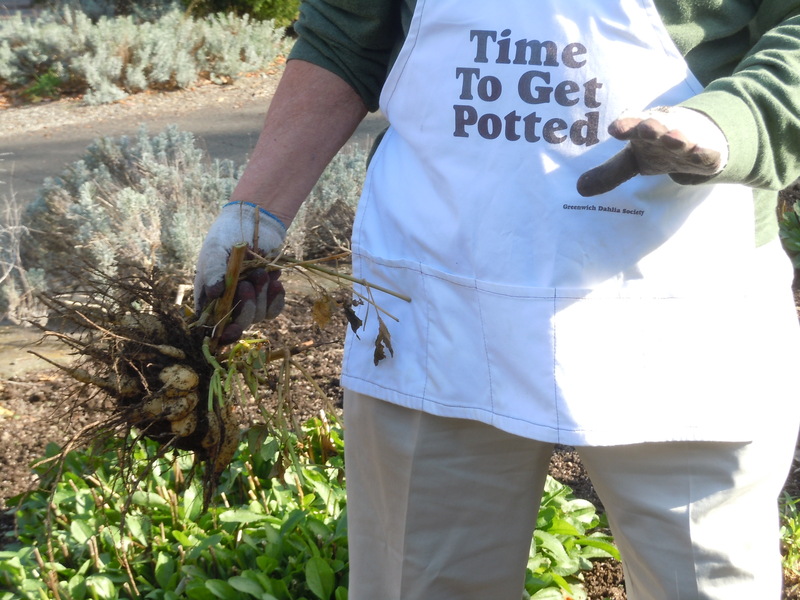 You can sometimes replant your tubers without dividing and keep it going like this lady did with this three year old clump. BUT! But make no mistake, you are not going to get your best plant with the best blooms from this! Like crowding puppies in a kennel, they are not going to thrive! One tuber with a crown, a neck, and growth eyes is all you need or want. Too many tubers planted together produces a weak plant. 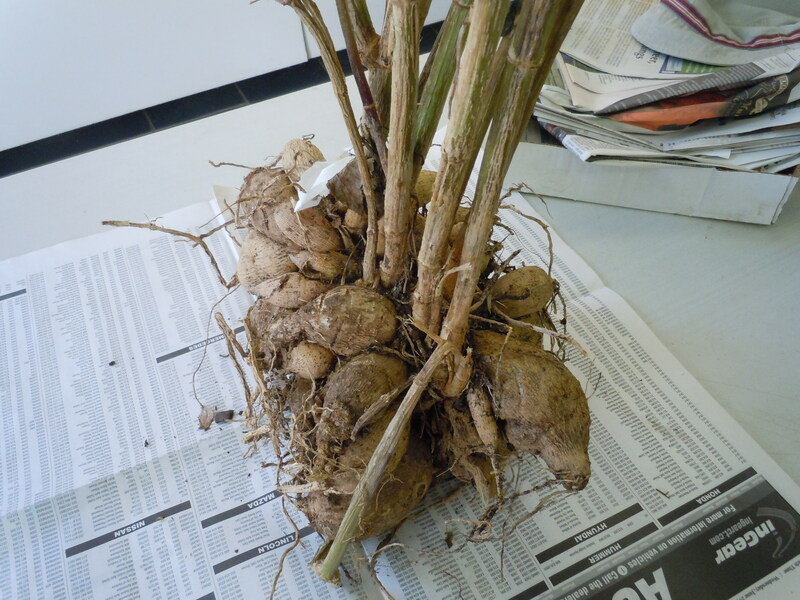 The plant is lazy and gathers its nutrients from the tubers and does not reach down with new roots to get the fertilizer, compost and benefit from your soil. So after a week of curing, go ahead and begin the surgery. OR place the tubers in boxes of peat moss mixed with perlite and store in a cold (not freezing) dark space, like an unheated garage that does not freeze. Wait to divide in the Spring. If you divide now, store just as you would the clumps. Carefully pack and do not let them freeze in their cold Winter home. 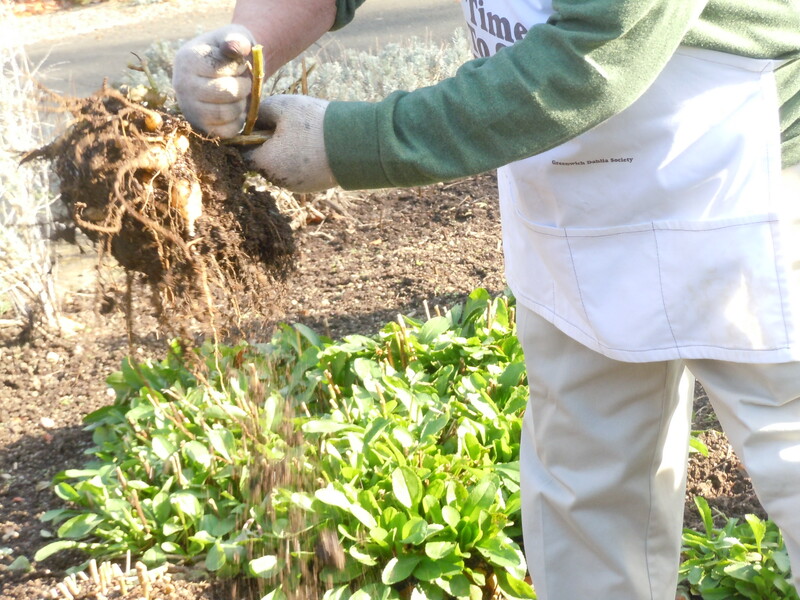 This entry was posted in Uncategorized and tagged digging dahlia tubers, dividing dahlia tubers, Garden Education Center of Greenwich, Greenwich Dahlia Society, storing dahlia tubers. Bookmark the permalink. Excellent tutorial thanks – I always wait till spring before I divide and also take cuttings which are quite successful. The cold weather has n’t hit us yet but all my dahlias are safely stored away in the shed – last year they all rotted so I have been extra careful this year. My shed is detached from the house and does go below freezing so I have had better luck with the garage which stays cold but doesnt go below the freezing mark, which is the kiss of death, or should I say the kiss of rot? Thanks for stopping by Elaine! Thanks for the tips. I dug my dahlias up a few weeks ago. They are in the shed drying out, awaiting newspaper wrapping and storage in my downstairs toilet, its the coolest, frost free place I have. Great idea – my husband can barely fit his car in the garage, but a car can withstand the freeze! My dahlias cannot! Thanks for stopping by!